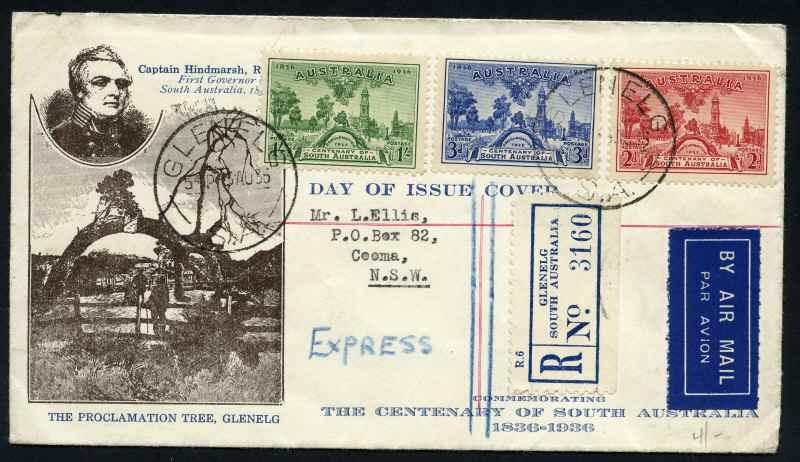 1936 SA Centenary set on Express Registered illustrated FDC. Selection of 57 mostly illustrated First Day Covers from 1937 to 1959, including a few special postmarks and some scarcer Standard Stamp Company covers. Some have toning or other slight faults. Selection of 359 Pre-Decimal and Decimal FDC's from 1962 to 1992 including 1966 Definitive set of 24 on individual unaddressed WCS covers. Majority of earlier covers typed addressed and 1980 onwards are official unaddressed including several souvenir covers. Also two 1932 Airmail covers from England to Australia. Collection of 550 Pre-Decimal and Decimal FDC's from 1956 to 1993 including a few special postmarks, some Australian Territories and Papua New Guinea, several Foreign covers, plus 215 PSE's cancelled FDI from 1979 to 1993. Also selection of MUH Australian Decimal issues (Face Value $79.00), range of 1977 Silver Jubilee Omnibus issues MUH and few miscellaneous items. Collection of 343 illustrated Decimal FDCs from 1966 to 1987, including some Australian Territories and Papua New Guinea, plus a few PSE's. Majority are typed addressed WCS covers including 1966 Definitive set of 24. Odd minor blemish. Collection of official unaddressed FDCs from 1971 to 2005, including some special postmarks, joint issues and Australian Antarctic Territory. Face Value $1,096.00. Also hundreds of packets, each containing 5 modern Decimal and Territories issues CTO with GPO Melbourne cancellation in shoebox, plus accumulation of many hundreds of commercial covers. Collection of official unaddressed FDCs from 1971 to 2009, including Joint Issues, Australian Antarctic Territory, Christmas Island Australia and Cocos (Keeling) Island Australia, plus a small range of PSE's cancelled FDI. Face Value $1,825.00. Also selection of 245 souvenir covers from 1972 to 2008, all cancelled with special, relevant or commemorative postmarks including 2000 Olympics collection in special limited edition album. Collection of official unaddressed FDCs (Face value $803.00) and Maximum cards (Face value $454.00) from 1977 to 1999, plus selection of MUH Decimal issues (Face value $95.00). Also 1977 Silver Jubilee Crown Agents omnibus collection of 28 FDC's in special album, PNG 1977 Silver Jubilee FDC containing K10 Silver proof coin, used Australian collection in Junior album and 5 Phonecard packs. Accumulation of official unaddressed FDCs from 1979 to 1995, plus 709 PSE's cancelled on FDI, including many duplicates and a few souvenir covers. Face Value $1,321.00. Also small range of Pre-Decmal FDC's. Collection of official unaddressed FDCs from 1979 to 1995 (FV $492.00), plus a range of souvenir covers with special postmarks, PSE's, Foreign covers and miscellaneous items including 1977 Australian Centennial Tour and 1980 Centenary Test Match collection of Cricket covers and photo's in special albums. Also Foreign collection of used stamps in loose leaf album. Accumulation of official unaddressed FDC's from 1970 to 2008, including some souvenir covers with special postmarks and a small range of PSE's with main strength in 1970s' and 1980's. A few PNG covers addressed. Odd minor blemish and varying duplication. Face Value $618.00, plus K78.00. Also 188 mainly addressed FDC's and covers including 1971 Christmas block of 7 (5), plus small range of coins and medallions. Largely complete collection of neatly typed addressed commemorative FDCs from 1973 Parliamentary Conference set to 2004 Christmas set including some light duplication, mainly with different special FDI postmarks, plus few Definitive and Regional issues. Face Value £599.00. Accumulation of 982 FDC's and Postal Stationary items from 1974 to 1991, comprising mainly Colorano Silk cachet covers. Also small accumulation of used stamps and postal stationary cut-outs in small box. Accumulation of 1,708 illustrated unaddressed FDCs from 1960 to 2012, with a range of countries represented, the main strength in U.S.A. and United Nations, including some postal stationary items. Many Fleetwood brand covers. Very high cost price.